Which "crispy, crunchy graham cereal" should you eat to "have a golden day"? This limited edition cereal was introduced by Kellogg's in March 2018. It's a "sweetened multi-grain cereal" that's shaped like Froot Loops. The loops are red, blue and purple. 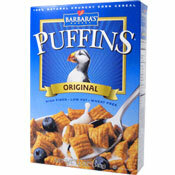 The cereal's flavor is described as Magic Cupcake. 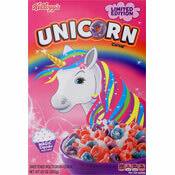 Prior to Unicorn Cereal's actual release date, the product was available exclusively at Kellogg's NYC Cafe located near Union Square in New York City. 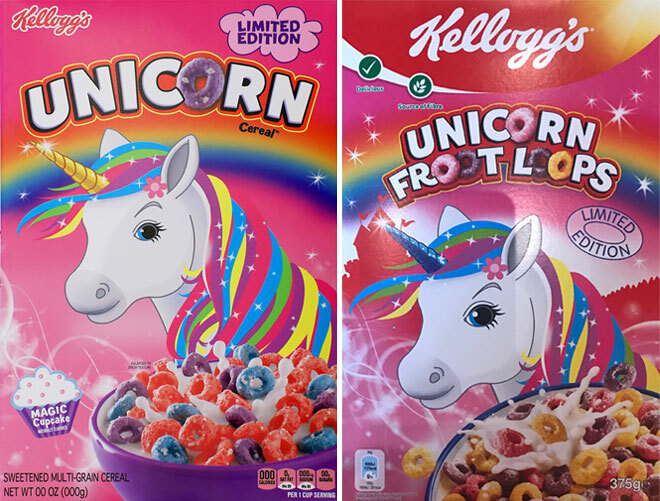 In 2017, Kellogg's introduced a very similar cereal in the UK called Unicorn Froot Loops. What do you think of Unicorn?